Part of a haul of books I picked up at Goodwill or a Friends of the Library sale to register on BookCrossing and wild release. I chose this one because it is either one I am interested in reading or one that will work well for a BookCrossing Release Challenge or because I know it's a book that someone in general would probably like to find and read. I fully intend to re-read this soon. This was a re-read for me -- last read probably in 1969 0r 1970. What strikes me now is the description of a lifestyle that has vanished or become part of the great melting pot of America. (And of the quote of one of the boys in my high school English class, when we read this who said on the homogeneity of our society, "America is not a melting pot. It's an acid bath." 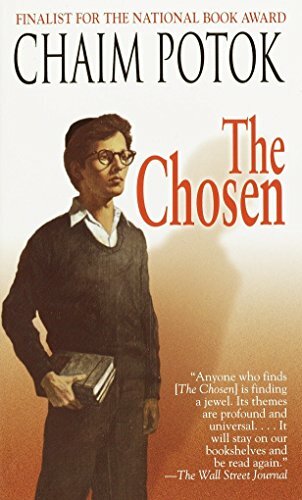 Anyhow, the initial part of the book charmed me again, and I found lost in the world of Reuven and Danny, and their unlikely, but hard won friendship. We so often hear about friendships across faiths, but all too often forget that it can be equally as hard to bridge differences within a common faith, yet across very different upbringings and beliefs. The friendship the boys build is a true one, though, as I said, hard work. Sometimes the obstacles come from their different beliefs, or sometimes, painfully so, from the different dynamics in their families. It struck me when Danny's father said "You think it is easy to be a friend?" to Reuven when they first meet. "If you are truly his friend, you will learn otherwise." The second half of the book was much harder for me to read and I stalled out a couple of times. Part of it was the nitty gritty of the stuff the boys were learning and the debates -- and part of it was the dysfunctional relationship between Danny and his father. It comes clear in the end, but is painful reading and not a parenting style I can endorse. What really grabbed me in the second half, though, was the description of the nation's response to Roosevelt's death and to the discovery of the true abomination that was the holocaust. For the former, it brought me back to 1963 when Kennedy was assassinated, and how we as a nation responded. For the latter, it opened up the wounds made by the idiots who are trying to deny the horrors of the holocaust these days. This was not the easy "trip down memory lane" re-read I expected it to be. None-the-less, despite the discomfort it raised in me, I am glad I took the time to re-read. Welcome to BookCrossing, a unique community of book lovers, sharing their libraries with the world. This book is now yours to read, enjoy, keep or pass on to another reader. The BookCrossing ID, which you entered in the "Enter a BCID" box on the website, is unique to this copy of this book. If you make a journal entry (either anonymously, or as a BookCrossing member) all previous readers of this actual book will be notified by email, and can follow the book as it travels. BookCrossing is free to join, completely confidential (you are known only by your screen name and no one is ever given your e-mail address) and a heck of a lot of fun. PS And if you find yourself liking BookCrossing, Charleston has an active group of BookCrossers who meet monthly (second Sunday of the month) at various spots in the Tri-county area. Come join us! For more information, see our yahoo group here! Be on the lookout for other books left in the "Wild"!